There are many hard working men and women earning their living on construction sites in D.C. - some we can see from our office windows. Even with the proper training, there are still significant dangers that come with working on a construction site. According to the data and stats compiled by OSHA, in 2010 alone, there were approximately 774 deaths due to construction site accidents. Here are some of the top construction site accidents, dangers and injuries (as compiled by OSHA). Falls from high heights or scaffolding. Falling debris, material or objects. Getting caught in-between objects of materials. Getting hit by a vehicle. When a construction worker is hurt on the job, it affects his health, livelihood, finances and brings challenges to his family as well. So what happens when a construction worker gets hurt on the job? On the job injuries can lead to expensive medical bills and loss of wages because he is unable to work or do the same type of work he's been doing his whole life. In order to alleviate some of the burden that comes along with getting hurt on the job, workers can seek help through their workers compensation insurance from their job. 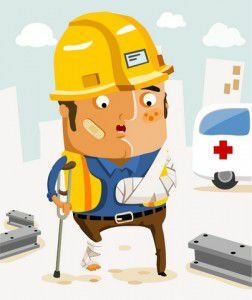 Will you need a lawyer for your workers' compensation case? That will depend on the seriousness of the injury and whether this injury will prevent you from earning a living for a significant period of time, require ongoing medical care, or a job change. If you have questions about any of this, you should get a lawyer. Many clients who have come to us after a work injury have had these concerns. It is important that if you suspect any of the above (loss of wage, change of jobs, ongoing care, etc), you should retain an experienced workers' compensation attorney to protect your rights. Workers' compensation cases are very complex and unless you know your rights, you cannot adequately protect yourself and your family. Especially because workers' compensation laws vary by state. One important thing to remember, the insurance companies are looking out for themselves only - and they already have lawyers, adjusters, nurses and doctors working to deny or limit your medical treatment and monetary benefits. If you have been hurt on a construction site and want more information, contact our office. Whether you call us at (202) 393-3320 or by email at [email protected], it is free and confidential. Get the protection you and your family deserve.